Lucifer brings the second of two bonus episodes with the final outing being a “what if?” scenario exploring what life would be like if things were just a little bit different. “What if?” episodes are generally fun on some level because it lets us see familiar character remixed in ways that let the actors do something different with the role and allow audiences to see something that a show couldn’t normally deliver because of the rules that have been established. In this case the question the episode ponders is “What if Lucifer had never met Chloe?”. When they crossed paths in “Pilot” it fundamentally changed their lives in ways that neither of them could possibly have predicted and watching the growth of their connection has made for a really fascinating dynamic that has continued to evolve since the show began. Asking the question of who these people would be if they hadn’t met when they did is an interesting deconstruction of the core concept. This alternate reality comes courtesy of the Neil Gaiman voiced God who makes a simple change by moving the bullet that killed Chloe’s father a few inches from its intended destination therefore meaning that he’s alive and well and Chloe never became a detective. The ripple effect of this small change is remarkable as Chloe remaining an actress means that she wasn’t around to investigate Delilah’s murder and didn’t put Lucifer on the path to solving murders. Lucifer is shown running his club, engaging in his usual brand of debauchery and preparing to expand to Las Vegas for a change of scenery. He appears to not have a care in the world and is enjoying his freedom from the influence of his father. His early interactions with Charlotte are really amusing and clearly show how different this world is by virtue of them kissing not being considered weird by Lucifer who only sees his mother in the main reality. He is initially reluctant to go through with the casual encounter with Charlotte but it’s more to do with him feeling unfulfilled by his life in general rather than finding the notion of sleeping with her actively distasteful. Charlotte is reset to the point of her reintroduction in this season; a corrupt lawyer with a long history of sinning and amoral behaviour designed to ensure that her guilty clients walk free. This is a Charlotte who continued to take the easy path and never learned the life lessons that make her worthy of a place in Heaven. Characterising Charlotte this way shows how important positive relationships are as this version has her darker impulses actively encouraged. Maze’ short appearance in this episode reinforces this idea. She is shown to be thriving on peddling sin and encouraging people to give into their innermost desires rather than actively working to make themselves a better person by resisting them. Charlotte robs Lucifer’s safe and Maze lets it happen because she knows that eternal damnation awaits which means that she has someone else to torture at some point in the future. We’ve seen Maze grow and change over the course of the series and become someone who values others while seeing herself as much more than Hell’s most celebrated torturer. This reality sees her without the relationships that made this possible meaning that she never learned that there is more to her life than the reason she was created. It’s a very short appearance but an effective one and ties into the overall message of how important it is to forge positive relationships. Dan is another character significantly altered in this new reality. In keeping with the theme he hasn’t had the benefit of learning from his mistakes and being encouraged to be a better man. His former relationship with Chloe and having Trixie in his life was a significant motivating factor for him but without those things he easily heads down a path of corruption. He is shown implicating the wrong people in crimes, skimming money from the evidence room and generally not showing any interest in bringing actual criminals to justice. Perversely he ends this episode driving into the sunset with Charlotte so has a happy ending though there is the promise of eternal damnation because he makes no effort to be better which makes his life in the main reality far more preferable. There is the constant impression of Dan being somewhat lost in this reality. He compensates for this emptiness by being selfish and materialistic but the audience knows what makes Dan a better person and he can’t get that in this reality. Linda has altered careers slightly to be a TV psychiatrist to the stars so spends her time interviewing celebrities in order to get insight into their deepest issues to entertain viewers. The lack of Lucifer in her life makes her somewhat directionless as she too feels unfulfilled by the work that she’s doing. Part of that is down to exploiting emotional issues by creating drama as a ratings grab. Her morality is still in place because she’s reluctant to do this but the important thing is that she goes along with it and ends up doing more harm than good. This is counter to everything that Linda otherwise stands for in the main reality and once again shows how meaningful an influence Lucifer along with everyone that comes with him has been in her life. 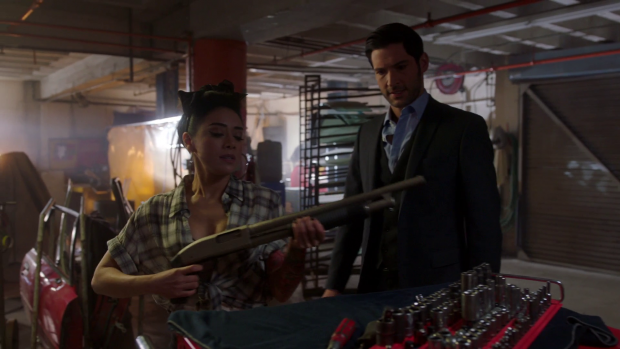 Ella is a morally ambiguous mechanic with no qualms about working on stolen cars and an asset to Lucifer. Having a pre-existing connection between them was a nice touch as it is consistent with Azrael working to bring them together even if it is different. Ella’s reason for her career change is down to being inspired by Chloe to turn her back on the law after watching half a film. She is shown to be intelligent and detail oriented as she is in her forensics job but her main focus is elsewhere. Unlike the other characters she doesn’t project a sense of emptiness in the same way so seems more secure with her life choices but the most notable thing is that she is less affectionate and spends her days mostly alone which is a far cry from the Ella we know and love. Amenadiel is completely directionless apparently moving through the cosmos on his own afraid to face his family because he’s so ashamed of himself. Part of that has to do with Lucifer not cooperating and causing him upset because Amenadiel feels responsible for him. His most defining alternate trait is that he rejects the notion of interacting with Humans because he’s afraid to do so. He is shown attempting to before stopping himself showing that the most positive thing to happen to him in the other reality was making meaningful connections with others and feeling a tangible sense of self worth as a result. This Amenadiel is self conscious and lacking in confidence. Chloe is an actress who plays a cop in a successful film franchise but she feels that she’s missing something in her own life. She is very good at playing a cop and feels comfortable with that but wants to do more than play one. Her father is alive and discouraged her from pursuing that career path meaning she only gets to experience that through playing a fictional one. The murder of one of her friends and costars is taken as an opportunity for Chloe to actually live the life that she wants after Dan gives up on the case and writes it off. Lucifer is also investigating the murder because it happens in his club and has frozen the Vegas expansion deal until the issue is cleared up. Their different reasons for investigating the murder bring them together and they strike up a partnership mostly to combine their resources. It’s fun to see them competing with one another at first with a fresh take on a familiar dynamic informed by the differences between the two versions of the characters. Fresh but familiar is how their partnership in this episode can be summarised. Tom Ellis and Lauren German have such natural chemistry that their altered characters are still a joy to see together and the competitive nature of their relationship makes for some really fun moments. By the end of the episode they each come to the realisation that solving this case made them feel more fulfilled and might be something they should actively pursue. I do wish the case was more interesting especially since it shakes both characters out of apathy but it isn’t all that memorable as with many of the cases. With this being a “What if?” scenario it is worth considering what the point of it was. 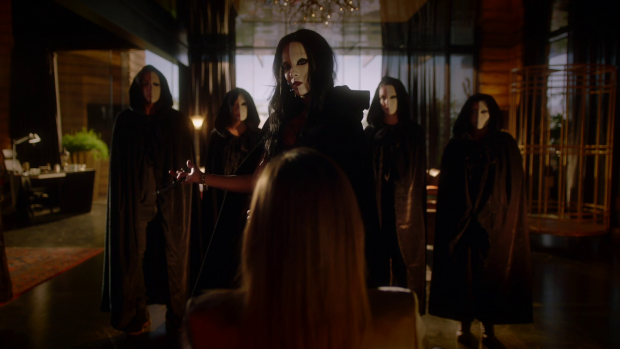 Many of these sorts of episodes involve at least one character living out a set of alternate possibilities that teach them a lesson before they are returned to their own reality having learned something profound about themselves or something in their life but that doesn’t happen here as the entire episode takes place within this alternate reality created by God so the episode begins and ends with the different versions of the characters. This episode was intended to be used in the fourth season that will likely never happen so it’s unclear if it was meant to serve as an in continuity reboot of the show so that the show could continue on with the same characters taking on slightly different roles. If this is the case then it’s a terrible idea as part of the magic of Lucifer is the characters that have been developed and the relationships that have been developed organically over time. The more likely purpose of this is that the episode is intended to stand alone while exploring who these characters are beneath the surface. Even when things play out differently their core personalities remain but they are much stronger when in each other’s lives. I suspect this would have come at a crisis point for a few of them when relationships are about to be torn apart so that the viewer can get a sense of what that might be like while providing full justification for their relationships being so special. Neil Gaiman’s God isn’t leaned on too heavily as a narrative device. It is made clear that he causes this reality to exist out of some desire to show how experiences shape one another. Neil Gaiman’s voice work is effective on a couple of levels thanks to the meta nature of him being the creator of the Lucifer comics. 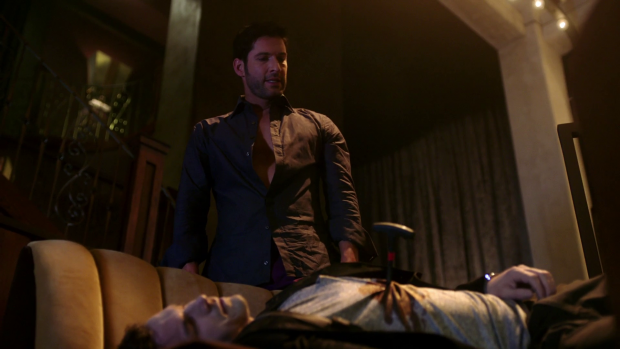 As a character he appears to be optimistic and compassionate which runs counter to how the audience has been encouraged to think of him because of Lucifer’s perspective on him. This episode confirms without a doubt that God only wants what’s best for Lucifer and the suggestion is that he created this reality to be a better life for his son. That last part is speculation but it’s interesting to find out how God sees Lucifer after so much speculation. In many ways this is the perfect episode to end the series as a whole because it reminds fans who these characters are by casting them in a different light and showing how their lives could have been while answering a long standing question. An excellent episode that delivers a fresh yet familiar perspective look at the characters and the world they live in. Each of the characters are introduced as being in a different situation than we’re used to but still fundamentally the same people only without the life lessons that have defined their growth over the season. The main thing they all have in common is that there’s something missing from their lives that was gained through forging positive relationships in the prime reality. There are some interesting twists such as corrupted versions of Dan and Charlotte having a happy ending with the promise of eternal damnation due to their life choices or Ella being inspired by a half watched film to turn against the law. 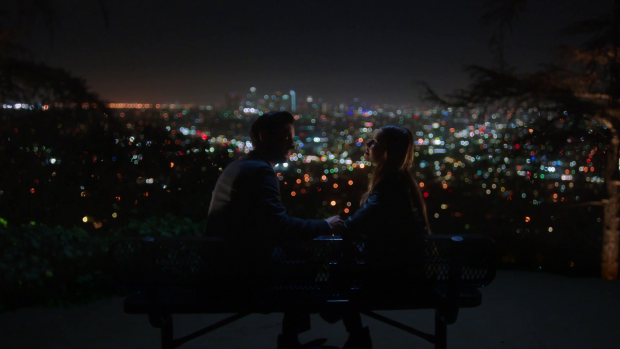 The episode has fun playing around with the fresh yet familiar dynamic between Chloe and Lucifer that has a more competitive edge while taking advantage of their natural chemistry. With this being a “What If?” episode that explores a reality the show doesn’t typically belong to while never interacting with the main one it’s arguably pointless but to me it exists as a showcase for how important the relationships that have been developed over the course of the series are to who these characters are. The fundamentals of who they are and their potential is the same but their lives are incomplete without them. Neil Gaiman’s God is a great meta addition because he created the Lucifer comments and his voice work shows a compassionate presence who confirms that he wants what is best for his son which runs counter to what we as an audience have been encouraged to accept about God thanks to Lucifer’s perspective. If this is to be the final episode of the series then it’s oddly perfect as it answers that long standing question while celebrating a strong set of characters and ending things on a really fun as well as endearing note. If you want to know my feelings on Lucifer as a show then I can only direct you to the words I put under the verdict on the season 3 finale. I have nothing to add and will still deeply miss this show. It was a nice surprise to get these bonus episodes that function as an effective goodbye to the show for me.